In spite of being in a GFZ, the doctor packed heat. Locally, Knoxville and Farragut persist in banning guns in parks, in spite of reported crimes in those areas. More at Examiner HERE. With no right to personal defense, nothing else matters. See video and discussion at Examiner HERE. Shiloh's Brew and Chew supports the Right to Keep and Bear Arms. See the Fox news Report HERE (after the ad). Go show a little love. Spend some $$. I will be voting for Jason Zachary to represent the Second District of Tennessee. Status quo is not working in Washington, D.C. As part of that status quo, the Duncan family has held the Second District seat for half a century, almost 20% of our nation's existence. As he wrote in a letter to my wife some years ago, the only term limit Mr. Duncan agrees with is for the electorate to vote him out. Let's honor that. Almost fifty years ago in 1965 when gas cost around .30 cents a gallon and a first class stamp cost a nickel is also when the former Congressman John Duncan, SR. was elected to office for Tennessee’s 2nd District. At that time, no one had been to the moon, Silicon Valley was just in its infancy, and the Woodstock Festival was even years off. Since then the Duncan legacy has built and maintained their very own and personal “entitlement program” with this seat financed through five decades of US taxpayers, pork programs, and influence. Its like shampooing your hair. . . .
How many times has this scenario played out in my lifetime? Hamas (or some other Islamist militant group) fires indiscriminately into Israel, shooting not at military targets, but at the general population. Israel fires back, inevitably hitting and killing noncombatants, because the aforementioned jihadis hide among the general population. American alphabet television has a tear-fest over the loss of life in Gaza. Israel apologizes for hitting the noncombatants. Hamas doesn't honor the cease-fire. Some outside government brokers a peace deal. How many times? Does anyone know? Did you know that when a vet needs to visit the VA in Knoxville he/she must travel to and from the VA facility unarmed. Doesn't matter if they have a Permit. Doesn't matter that Tennessee law now authorizes permitless vehicle carry. More commentary HERE. The CDC keeps having serious problems with storage of deadly bacteria. They should concentrate their resources there, rather than their bogus leftist attempt at designating guns as an epidemic problem. The epidemic is one of recidivist criminals plaguing our society, and our sport fishing criminal justice system. There is an inverse relationship between lawfully owned guns and crime. More guns, less crime. Chicago, on the other hand has a long gun ban history, with a correlating high crime rate. Read my commentary HERE. Questions about guns in Target, etc. . . The recent addressing of firearms policy by Target stores raised some questions over on Facebook. I address those questions HERE. Target's policy is similar to that of Chipotle, as reported HERE. Stan Stilleto the switchblade has found new freedom in Tennessee. Read about it HERE. A note to Rick Perry and other southern border state governors. You have, I believe, the authority to call out the National Guard. 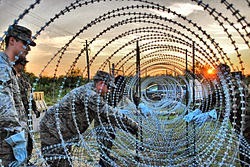 It is high time to activate them, and unroll a few hundred miles of concertina wire. We are undergoing a full-scale invasion and the dear leader in Washington is not going to do anything about it. Step up! Seal your portion of the border! Quit complaining about his inaction! Disclaimer: The information and ideas presented in this column are provided for informational purposes only. 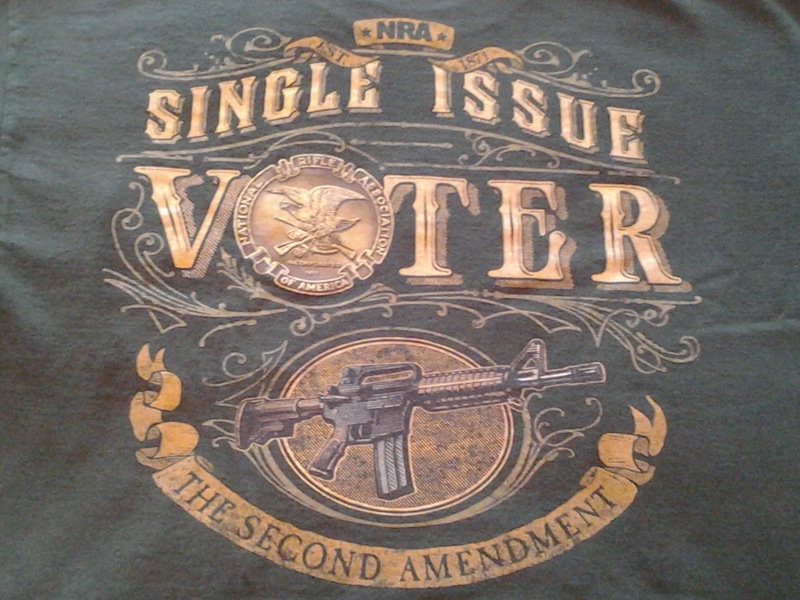 Gun rights, like all other Constitutionally recognized rights, must be exercised responsibly. Firearms, like cars, kitchen knives and life itself all can be dangerous. You should get professional training as part of any plan to use firearms for any purpose. I have made a reasonable, good-faith effort to assure that the content of this column is accurate. I have no control over what you do, and specifically, accept no responsibility for anything you do as a result of reading my columns. Any action or lack of action on your part is strictly your responsibility.